An article from BNet that I had come across few months ago presented findings from a Nielson survey on how Social Media networks like Facebook, Twitter, LinkedIn etc broke down by age. The data was very interesting because the more active users – comprising of over two thirds of the total number users – came from upwards of 25 years of age. Last week I chanced on a comprehensive report from another of Nielson’s studies that reveals more specific demographic data and puts forth that the biggest users of LinkedIn are aged 30 to 49 and the second biggest users are in fact older – the 50 to 69 year olds. While this may not be too surprising about LinkedIn users as it is positioned for the Professional Networker, the numbers on Twitter seem to show a similar pattern of usage. For too long the common perception about these social sites has been that they were patronized more by the younger audience – college and high-school kids talking about ‘cool’ stuff. And despite what these statistics seem to be presenting, the perception continues. I live with a very interesting, intellectually active couple, Nancy and Tim, in their early 50s who use the internet for email, skype, some basic online shopping, googling, etc – and of course Facebook and LinkedIn. These are folks that are not concerned with IT or BPM and strictly speaking, both of them being in professions relating to Fine Art, aren’t those with the common jobs that you and I may be familiar with that involve the internet, IT or Enterprise Software. They spend a significant amount of time on Facebook and LinkedIn. To me, they are a perfect testimony to these findings. In my conversations with them about Twitter and Blogging, the perception of Twitter being a platform for the younger Gen – or the Millenials, if you will – did seem to be apparent, although they are able to see reason in why such survey data points quite the other way. These two very dramatic charts from Nielson bust that Myth if you are still not sure where the biggest chunk of users might come from. 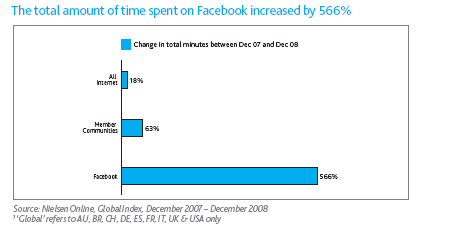 The first – an analysis of total internet time spent on Facebook between Dec 2007 and Dec 2008. A lot of factors may have contributed to this explosive growth, but still 566% growth on one platform is quite significant to dismiss as a passing fad. 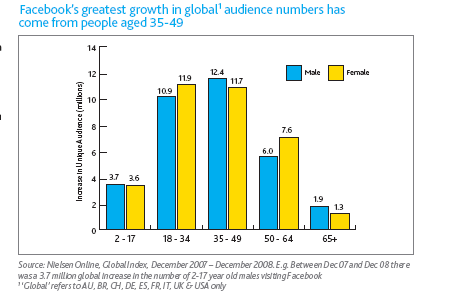 The second chart was one that gave the demographics of this growth. It is hard to miss what this implies. This is spot on. these networking tools are surely useful for the younger crowd, but the working professional is beginning to see tremendous professional value and benefit and return of investment of internet time. And yet, I would think these growth charts are only the beginning of a bigger trend. If my guess is right, it’s only the early adopters who are contributing to the numbers on these charts so far. There are several more who are aware of these tools and platforms and will join in as time goes by. And so, this is a trend that is going to become more significant as the laggards join in as well. But what I am talking about is not just the awesome numbers here. I am talking about the bigger influence on online behaviour that these numbers suggest – at home and at work. When the mindset of such a larger audience is influenced by participation in network communities and groups, organizations will go beyond the talk and will be able to identify significantly more tangible benefits in improving workforce effectiveness and productivity by leveraging such usage patterns. They will see more value in fostering communities and fanning collaborative interaction among employees and external business communities including customers – all of which are being talked about and explored already. And that is the time when Social Media capabilities in BPM will really gather momentum and manifest in features and functionality we may not have quite thought about so far. With 112 queries in 1.270 seconds | Valid CSS 2.1. | Valid XHTML 1.0 | 88 posts within 27 categories, 225 tags and 24 widgets.